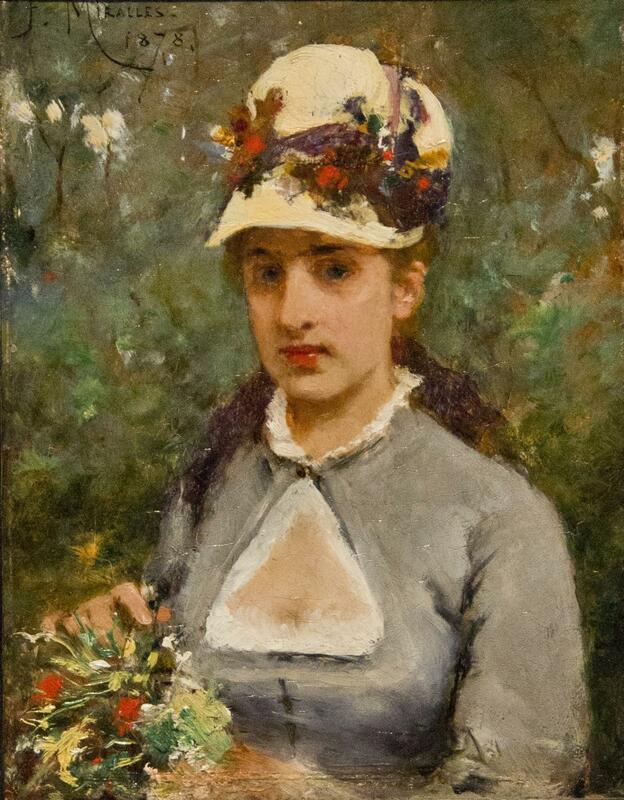 Francisco Miralles was a Catalonian painter, best known for his realistic scenes of bourgeois life and high society. A native of Barcelona, Spain, he received his first artistic training in that city with Radon Mart Alsina. His earliest known works are of the people and surroundings familiar to his youth. In choosing subject matter, Miralles often looked to the bourgeoisie of the Second Empire for inspiration, and from that group, he often chose to paint women, especially fashionable young ladies. Eager to broaden his artistic horizons, he made his first visit to Paris when he was fifteen. He would return there three years later and stay for the next twenty-seven years. He enrolled at the Ecole Nationale Superieure des Beaux-Arts and had additional instruction at the studio of Arturo Canela, which also happened to be the social center of the Catalan artistic community, and where Miralles established many professional friendships. After the Franco-Prussian war and a short return to Barcelona, Miralles set up his own studio in the fashionable Boulevard de Clichy. He soon played host to many famous personages including Sarah Bernhardt, who would frequently appear in his paintings. With Miralles' wide acquaintanceship and the high reputation that his paintings acquired, he developed a large clientele among Parisian society, thus allowing him to live quite comfortably. Such was his popularity that from this period forward, each of his paintings had a buyer before it was even finished. At the height of Miralles' powers, Gomez and Goupil arranged for his appearance at the major art events in London, Berlin and the United States. Otherwise, he exhibited regularly at the Paris Salons and at Barcelona's Sala Pares from 1877 onward. In 1893 Miralles returned to Barcelona due to family problems and set up a studio where he took a number of students. There he remained until his death in 1901. In choosing subject matter, Miralles often looked to the bourgeoisie of the Second Empire for inspiration, and from that group, he often chose to paint women, especially fashionable young ladies. 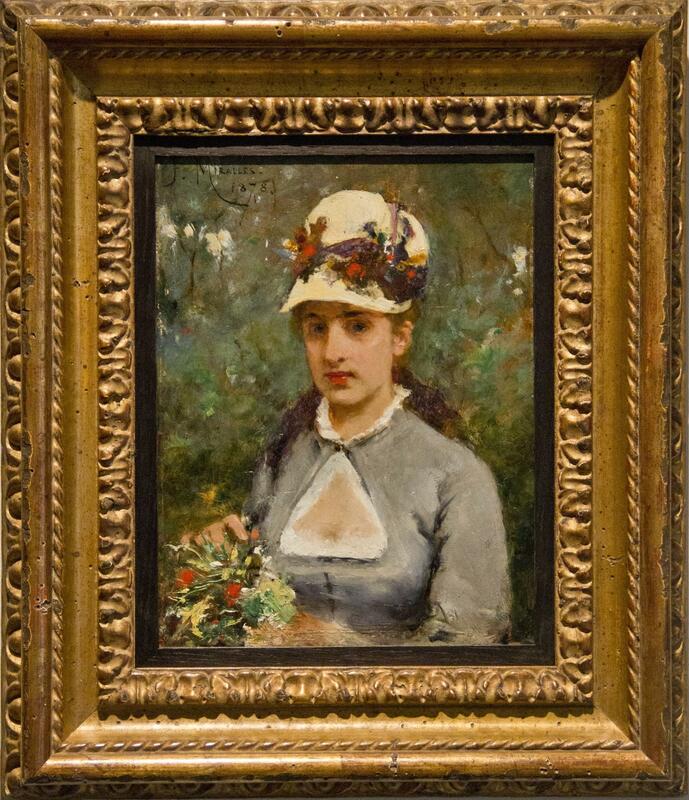 His favorite model and companion was a woman named Gabrielle who potentially could be the subject of our painting.